The park has been closed since Oct. 1 because of the first shutdown of the federal government in 17 years. For months, Julie and Eugene Gillies had planned to celebrate their wedding anniversary in Bar Harbor. The South Portland couple wasn’t about to let a political fight in Congress get in the way of their plans to see Acadia National Park, which they visited on their honeymoon 34 years ago. Riding on small motor scooters beneath a bright blue sky Sunday morning, the couple skirted around the barricades and past the sign declaring the park closed and joined what they estimated to be about 1,000 other hikers and bicyclists heading up the Loop Road toward Thunder Hole. Another couple from South Portland traveled with them, also on scooters. Their idyllic morning came to an abrupt end when they were surrounded by park rangers. The price for violating the park’s closure order: $100 tickets for each member of the party. Rangers over the weekend issued seven citations for allegedly violating the park’s closure order. Nationally, America’s 401 national park areas have gates blocking entrance roads. In all, 21,000 National Park Service employees have been furloughed. 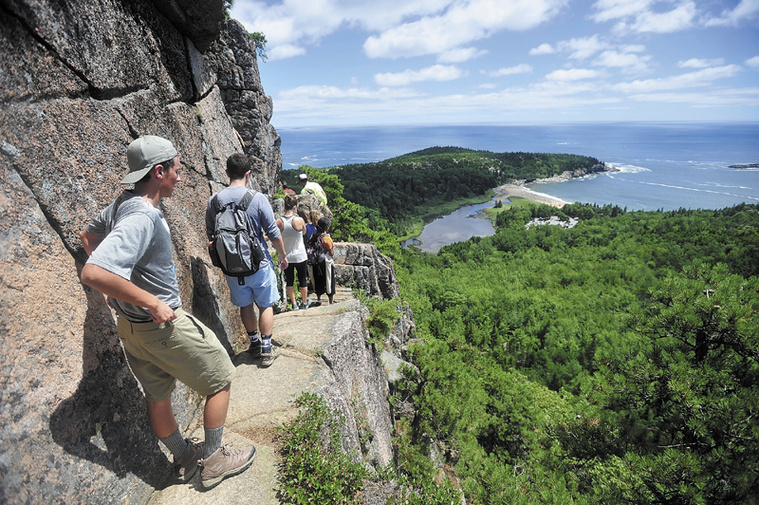 At Acadia National Park, which normally has a staff of 206 people at the park, only 15 “essential” workers are now on duty and focused on security, Chief Park Ranger Stuart West said. Besides four people riding mopeds, rangers fined two people who were riding motorcycles and cited a couple who were camping. Rangers are not fining hikers or bicyclists. Officials say they are fining people using motorized vehicles because they pose the greatest safety risk. Eugene Gillies said he did not see any signs warning people that they could be fined for entering the national park. All park roads — including the Park Loop and the route up Cadillac Mountain — are closed to traffic. Hiking trails and carriage roads also are closed. West said there have been reports of people painting graffiti on barricades, moving barricades and damaging closure signs. “The public is clearly frustrated with the whole situation,” West said. And not just in Maine. On the West Coast, vandals have hit Santa Monica Mountains National Recreation Area, where they cut open locks to gates barring entry to the recreation area in California. Rangers at parks around the country have urged people to abide by the closure, saying they don’t have the personnel to keep visitors happy or to safeguard the wildlife and other natural resources that they are charged with protecting. Rangers say recent incidents in Acadia show the risks posed when people enter the park during the closure. On Saturday, a 69-year-old Portland woman was rescued when she fell and cut her knee while hiking on Flying Mountain. Unable to walk out, she called 911 around 11 a.m.
A crew of four rangers was on site when the call came in. They contacted local emergency responders for help. The woman was taken by ambulance to the hospital. On Monday, a man fell on the north side of Dorr Mountain. Tourists and vacationers are not the only ones angry about — and in some cases paying a price for — the park closure. Business operators around the park have said the deadlock in Congress has cost them in lost customers and canceled reservations. Acadia National Park, which typically gets about 285,000 visitors in October, has been closed to the public just as the fall foliage season begins, potentially having a major negative economic impact on Mount Desert Island and Bar Harbor. More cruise ship visitors visit the park in October than in any other month of the year. Overall, October is the park’s fifth-busiest month.